As the Big Time has ended, The End Time will soon begin! 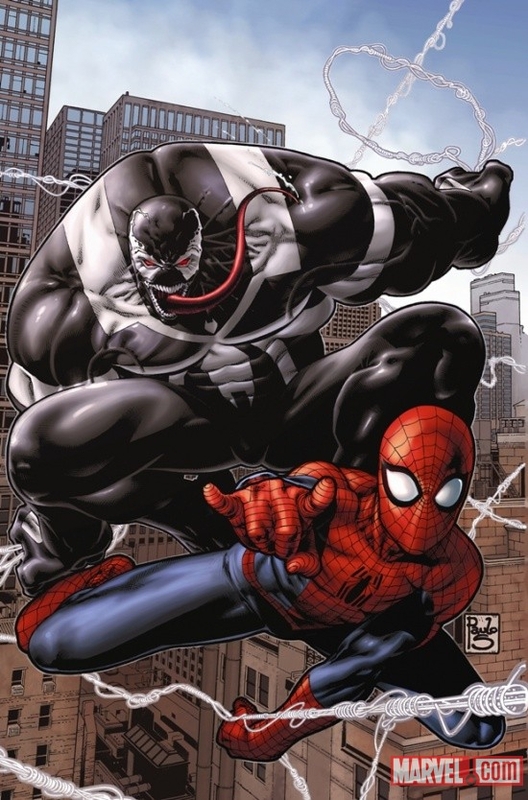 Amazing Spider-Man #654.1 is the second part of its previous issue (Amazing Spider-Man#654). With Flash Thompson as the newest and probably second best Venom, how will Flash control the demon/beast within? Is it already too late for Flash to resist the Symbiote’s hold on him? Or will Flash rise up to the challenge and control his “other” side. This story is all about Flash Thompson and his first mission as Venom. Get ready for the newest story arc, which will be releasing soon. Written by Dan Slott and artwork by Humberto Ramos. With Flash on his first real mission, he only has 48 hours to complete the mission or else Venom will take over. While only having 19 missions he can do total and once he does his final mission he won’t be able to use the suit. While Flash is in control of the Symbiote suit he is already having attitude suggestions sent to him by the Symbiote. While going undercover in a meeting with dangerous world leaders that have tons of money he goes under the guise of Gene Heisman. As Gene, Flash places a tracer on a woman that has a connection to the man that the U.S. government needs. While mission one was a complete success, mission two has yet to be undergone. About to make it to his 48-hour toll he soon removes the suit and heads back to New York. Back at his apartment, Flash is eagerly waiting to put the Venom suit back on. This shows that the Symbiote might have a hold on Flash! However, when Betty comes in and tells Flash about Marla’s death he makes a mistake and tries to stand up out of his wheelchair. Falling on the ground, Flash states that he sometimes forgets that his legs aren’t there anymore and Betty asks him to talk with Peter. When he finds Peter talking to his ex Mary Jane, Flash thinks that Peter is making a wrong choice by not talking with his girlfriend. Later on, Flash does his second mission and goes in to capture the guy that the U.S. government needs information from. With the Symbiote, Flash makes quick work of the guards and heads into save the target. The target was being held hostage by Flag Smasher who eventually makes Flash turn into the monstrous Venom! Venom was chewing up everyone he spotted while Kassim (his target) was watching. In the end, Flash reverted back and gave him to his partners. They asked if he had “Venomed-Out” and Kassim backed Flash up and told him he didn’t. As the story unfolded, Flash becoming the Venom that eats everyone was really interesting. Dan Slott did an excellent job at keeping Flash alive for another issue and also having the appearance of "Venom-Venom." The spoilers at the end are too good to spoil and so you're going to have to buy the comic yourself. However, there was another “mishap” that occurred with Flash’s transformation. That’s the only hint I am going to reveal. Dan Slott is one of the coolest Spider-Man writers today and I like how he frequently decides to add a Spider-Man panel from his original creation days. You can notice it by the artwork. Humberto Ramos is also one of the best Spider-Man artists today. I like it when he and Dan always team-up on a series and write and draw with one another. It’s always good to see when you have a really likeable writing and art team on a series who know what to convey to keep readers hooked in. Amazing Spider-Man #654.1 is the ending point of Big Time, and the beginning of End Time. Or is it?! Venom is one of the most interesting villains/hero in Spider-Man’s life right now, and it’s going to be pretty cool when they –SPOILER. Good I didn’t spoil that, right?